Jockey Victor Espinoza celebrates aboard American Pharoah after winning the Belmont Stakes and the Triple Crown. 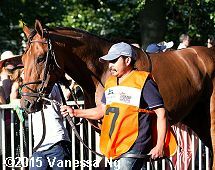 The $1.5 million Belmont Stakes (G1), contested at 1 1/2 miles on the main track for 3-year-olds, is the third jewel of the Triple Crown, with 90,000 paying fans coming out to Belmont Park in Elmont, New York hoping to witness history. Conditions were excellent with sunny skies and temperatures in the low 80's. 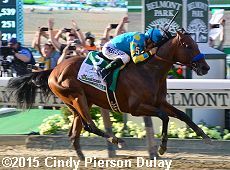 As expected, Kentucky Derby (G1) and Preakness Stakes (G1) winner American Pharoah was sent off as the 3-4 favorite in the field of 8, winner of 7 races in a row dating back to the Del Mar Futurity (G1) last September. In to challenge him and attempt to break up the sweep included 4-1 second choice Frosted, fourth in the Derby after winning the Wood Memorial, and 5-1 third choice, Materiality, winner of the Florida Derby (G1) then 6th in the Kentucky Derby. Down the stretch with American Pharoah drawing away from Frosted. As expected, jockey Victor Espinoza sent American Pharoah to the front immediately, and he set easy fractions of 24.06, 48.83, 1:13.41, and 1:37.99 while pressed by Materiality and stalked by 14-1 Mubtaahij and 17-1 Keen Ice. On the far turn, American Pharoah began to open up on the field. Frosted, 5th early under Joel Rosario, moved up to challenge but American Pharoah was 2 lengths in front at the top of the stretch through 1 1/4 miles in 2:02.33. Down the lane American Pharoah left the field in his wake, drawing away with ease to win under wraps 5 1/2 lengths ahead of Frosted in 2:26.65 over the fast main track. It was another 2 lengths back to Keen Ice Third. 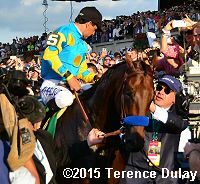 Left: American Pharoah takes his walk down Victory Lane led by his owner Ahmed Zayat. 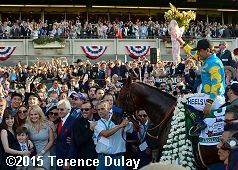 Zayat said, "I have been through the whole time saying he's a very good horse, he could be special but in order for you to come and win the Triple Crown, you have to define greatness, and he does everything so easy. We all wanted it. We wanted for the sport. So I'm happy for the horse, for the fans, and for this man who got a horse off an injury to come and compete and do what he does, everything has to go perfect but you have to be literally a magician. You have to be an incredible trainer." Right: American Pharoah in the winner's circle with trainer Bob Baffert and his family. 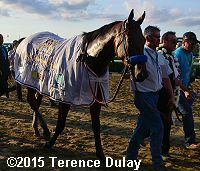 Baffert said, "I could tell and I told Victor in the paddock that he was ready. I told him to go ahead and ride him with confidence and he did. He rode him with extreme confidence. I said to put him on the lead and go for it and if he doesn't make it don't worry about it, but he just kept on rocking and rolling. Down the backside, he was in his groove, and I knew that if he's a great horse, he's going to do it. He's just a great horse. It takes a great horse to do it." Left: American Pharoah parades for the fans. Winning jockey Victor Espinoza said, "He walked into the gate amazing. He was ready today. As soon as I sat in the saddle, there was so much power and so much energy this horse had. He trained just perfect, just unbelievable into this race. Warming up he was just class, all class. He was a touch slow out of there, but I sent him anyway." Right: The trophy celebration with the happy connections. 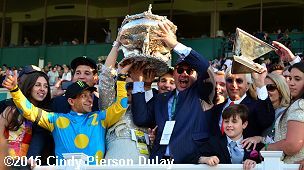 Winning owner Ahmed Zayat said, "The horse will come first. We have to see how he comes out of the race. But knowing Bob, knowing how competitive he is, we would like to enjoy him as long as we can but he have to come up, he have a very, very long campaign. I personally made a promise to my family and to the fans more than anybody else. We need to enjoy our stars and race them as long as we possibly good." 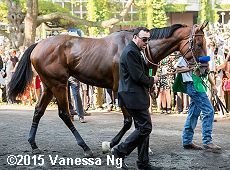 Left: American Pharoah in the paddock. 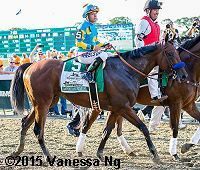 Baffert added, "Once Victor got him in the clear and got him into that beautiful mode of the way he just goes over the ground, I just loved every fraction. I saw 13 and change; I loved that. I was talking to Jill the whole way around there and turning for home, I was preparing for somebody coming because I've been through this so many times. I was just hoping for once and I could tell at the 1/8 pole that it was going to happen. All I did was just take in the crowd. The crowd was just thundering and I was just enjoying the crowd and the noise and everything happening. Thirty-seven years we've waited for this but, you know what, this little horse he deserves it. He's just a great horse and the way he's been all winter and this spring has been incredible. I just feel like I have a very special horse, and he's the one that won. It wasn't me, it was the horse." 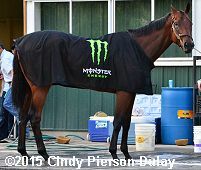 Right: American Pharoah in his Triple Crown winner blanket. Left: American Pharoah made a brief appearance at his barn after leaving the test barn. Espinoza added, "In the first turn it was the best feeling I've ever had. I was so concentrated in the stretch, I said, 'You know what, I've been here three times.' I didn't even get excited. I was excited in the first turn. You know, turning for home I was like, 'This has not happened yet.' I wanted to ride to the wire. I just dropped my hands and he just took off. It's just an amazing feeling that you have when you're 20 yards from the wire. And then at the wire I was like, 'I cannot believe I did it.' I win the Triple Crown race now, but I didn't make any money, because I donated my money to the City of Hope." 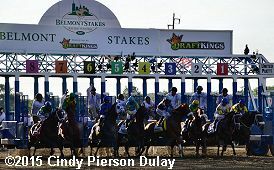 Right: The horses break from the gate for the 147th Belmont Stakes. Left: Second place finisher Frosted returns after the race. 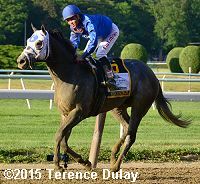 Jockey Joel Rosario said, "My horse ran great, but the horse everybody expected to win won the race. My horse ran really great and we got second place. It's exciting because we have not seen this for so long and the winner really looked brilliant. My horse showed that he is a really nice horse and there will be lots of races down the road for my horse." Right: Third place finisher Keen Ice in the paddock. 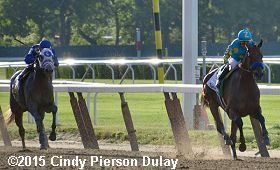 Trainer Dale Romans said, "The horse was perfect. My horse ran his race. It's an amazing thing to be a part of. Bob Baffert is the greatest trainer of all time. My hat's off to him. Congratulations to the Zayats."